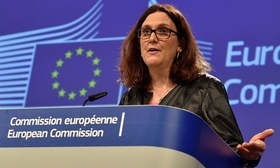 Cecilia Malmström, EU commissioner for trade, has expressed confidence that the U.S. will not impose tariffs on auto imports from Europe. "But we presume that the Americans will stick to the agreement that as long as we talk in the Executive Working Group there will be no additional tariffs," she said. The EU says it has delivered on several of last summer's commitments to avert a trade war, including increasing its imports of U.S. soybeans by 112 percent and taking steps to increase its imports of U.S. liquefied natural gas.